Exercise bikes existed long before the swanky and extravagant treadmills and elliptical machines made their debut in the fitness market. But back then, owing to their equally posh price tags, it was not a common sighting in households. Those who wanted to work out and take benefit of such sophisticated machines had no option but to purchase a gym membership. Today, times have changed. Exercise bikes are made in different designs as well as different price ranges making it more affordable to a common person. One of the main reasons why people think of purchasing an exercise bicycle for home use is to lose weight. Hence, they do not bother to look beyond this requirement and buy the first bike they are shown. This is definitely not the best exercise bike for home use. Several aspects have to be factored in when looking for an exercise bike for household use. What are they? We will tell you in this short write-up in this home exercise bike reviews. 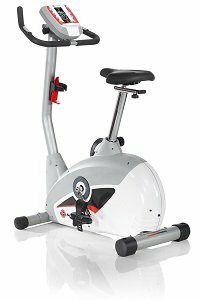 The first step to choosing the best exercise bike for home is learning about the two main types of exercise bikes – the upright bikes and the recumbent bike. Both styles of bike are suited for home use. However, each has distinct features that distinguish them from the other. An upright bike closely resembles the bicycle you rode around the neighborhood as a child. It has a small seat and a handlebar on the front for support. The pedals are in line (vertically) with the seat; so you have to pedal downwards. A recumbent bike, on the other hand, is known for its large and reclined seat. The pedals are in the front and almost in height with the seat. Thus, a person can lie back and pedal comfortably. The seat also has a backrest for additional back support. Each type of bike caters to different groups of people in relation to their physical needs. The positioning of the seat and pedals on a recumbent bike reduces the impact on the joints – knee and ankle. For this reason, a stationery recumbent bike is regarded as a great choice for persons suffering back pain and knee problems. However, if you have no such physical problems and want to burn calories, the best exercise bike for home use is the upright bike; it provides for a more intense and challenging workout. Inspect the build and quality of construction. The bike should be sturdy and stable. Look for the weight rating – the weight capacity it can carry. Bikes are usually rated 300-400 pounds. Selected exercise bike models tend to make more noise than others during an operation. To buy the best exercise bike for home use determine the noise levels you are comfortable with. Exercise bikes also boast of other features such as heart rate monitors, odometers, speedometers, calorie counter, preprogrammed exercise routines, adjustable resistance levels, book rack, water bottle holders and the like. The features add variety to your workout. A gym is designed keeping in mind the space requirements of such large exercise equipment. However, not all homes allow for the same. The exercise bike that will be the best exercise bike for home use for you depends upon the amount of room you have to accommodate it. If you are confined on space, you may have to choose a smaller, manual bike or the foldable designs. If you have ample room and are willing to spend why not go in for a programmable electronic one? When it comes to buying the best exercise bike for home use, many ask if it would be advisable to choose a used bike. Many gyms and health clubs sell exercise equipment at lower prices at the time of upgrade. There is no harm in purchasing used equipment, but as a precautionary measure, you should always evaluate the condition with the help of an expert. What does your pocket allow you? The best exercise bike for home use is not only about the design and features but also the cost. Don’t go by the notion that a higher priced bike will always guarantee good quality. In most cases, the price of an exercise bike for home or commercial use is determined by the features it packs. The more the features, the pricier it will be. Exercise bikes are available from $100 to above $1000. Based on your budget, opt for an exercise bike that is durable, stable, convenient and efficient. Inquire about warranty and service assistance available on a particular bike model you wish to buy. It is often believed that a person or object is not always as good as it looks. The same applies for the best exercise bike for home use. So, why not try it out first? Ensure that the bike fits you properly. With the help of a gym trainer adjust the seat to optimum height. Ride it for a few minutes to test if it feels comfortable. Many retailers and store owners offer a trial period – certain duration to test the bike on your home environment. This is a real prize for apartment dwellers. The Exerpeutic 400XL Folding Recumbent Bike boasts of sophisticated features such as a high-torque crank system, magnetic tension control, quiet V-belt drive, and a large-size LCD computer display. The weight rating is 300 pounds. Like every other exercise bike, the LCD screen provides workout statistics such as speed, calories, distance, time and heart rate monitor. The one feature that makes it the best exercise bike for home use is its foldable design. It’s neat, sleek and ergonomic design qualify it as one of the best exercise bikes for home use. Other product specifications it is known for being 17 programs, 16 resistance levels, 20-pound flywheel, adjustable handlebars and telemetry and contact heart rate monitoring. The extra-wide seat offers maximum comfort. It also offers quiet and smooth operation. With this short article as your guide and a bit of personal research, we can vouch it won’t be perplexing to choose the best exercise bike for home use. Start today! We hope it helped with this exercise bicycles reviews.